When volleyball exited Amber's life, she needed to fill the void. 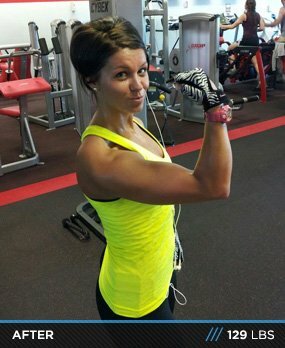 She had options with her education and personal training experience, but competitions were her calling! After my volleyball career and during my master's exercise science program at the University of South Dakota, I came across Bodybuilding.com and was hooked. I wasn't concerned about making my own workouts during volleyball. After four years, it was challenging to come up with workout routines, diets, and supplementation plans. I Googled workout plans and found Bodybuilding.com, which had tons of information on nutrition, workouts, blogs, and recipes. I've been hooked on Bodybuilding.com since. As a group fitness instructor, I always encourage my clients to set goals. It's a great feeling as a trainer to watch a client reach a goal they thought was impossible. After seeing this for years, I decided it was time to set goals for myself. Early mornings, hard workouts, and choosing chicken over pizza paid off. I saw changes in my body and the final outcome was greater than I imagined. I never thought I'd have the courage to step on stage in a tiny bikini with insane lighting in front of hundreds of people, but I did. The knowledge I gained from Bodybuilding.com gave me confidence to compete in my first bikini show. It was an amazing, uplifting experience, and I cannot wait to do it again. My confidence, energy level, happiness, and knowledge have improved during this challenge. I don't have to look at women in fitness magazines and wish I looked like them. Now, I look in magazines for the next step to become a fitness model and inspire others to overcome the fear of failure. I didn't let the fear of failure stop me from obtaining goals or stepping onstage and I don't plan to let it stop me. Lifting weights and exercising on a regular basis is something I will keep in my life forever. I attended my husband's first bodybuilding show and was amazed by the confidence and swag of the bikini girls onstage. I added it to my bucket list right away. The courage and commitment of these beautiful women kept me from committing immediately. I didn't want to tell everyone that I was going to compete if I couldn't be 100 percent dedicated. Months of debating passed. After my husband's third bodybuilding show, I decided it was time to do a show and reach my bikini goal. My husband was ecstatic about my decision to compete and decided to do the show with me so we could diet and exercise together. I cannot thank him enough. It made the process easier. The diet was the most important measure I took to reach my goals. I never fully believed that abs are made in the kitchen, but it's right on. I saw results after three weeks of clean eating. I didn't change my workout routine, so I knew the results were coming from food choices and limiting my alcohol consumption. I have a hard time taking pills consistently. Having a pill organizer helps immensely. I eat every 2 1/2-3 hours and drink a lot of water throughout the day and with each meal. The most challenging part is finding the energy to put myself through hard workouts. Since I lowered my carb intake, it has been a struggle to push myself. I've been attending more fitness classes to drive me through workouts. I love doing yoga on active rest days. I want to continue my fitness journey by competing in more bikini shows, receiving a pro card, and earning a spot in a fitness magazine. I love inspiring and helping others achieve goals. I want to do that through teaching group fitness classes and personal training. Set obtainable goals for yourself; short term and long term. If you have a bad day and cheat in the kitchen or weight room, don't get down on yourself. Be accountable for your actions and get back on track. Allow yourself one cheat meal per week. Surround yourself with people who believe in you and your dreams. Every journey has to start somewhere. Don't let the fear of failure get in your way. Embrace and love your body. Bodybuilding.com had the workout programs, supplement guides, and motivational articles to get me where I am today. I'm thankful I found it and will continue using the site for the rest of my healthy life.